We take pride in every build — big or small. We’re tank builders — constructing solid, tough tanks is in our blood. And we get no greater satisfaction than building you the exact right tank that fits your needs and your budget. As licensed general contractors, we can handle every aspect of your build from foundations to roof systems and sidewalls and everything in between. One of the most commonly asked questions is, “How long will it take?” Of course, the specifications of your project will dictate the construction time, but after 30 years in this industry, we’ve perfected a smooth construction process, which we can adapt to virtually — it typically takes less than twelve weeks from start to finish. We erect many of our tanks using the proprietary jack system, where the tank is built from the top down and from the ground up. 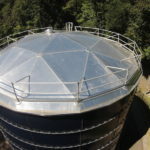 We erect the top ring and roof first, then raise the tank on the jacks to the proper height, installing the next ring underneath until the ideal tank height is achieved. This allows for minimal use of scaffolding — making the construction process much more efficient. Building an Aquastore Tank starts the moment we receive your contract—we take care of all the administrative work and gather all the necessary materials. Then, we schedule the site work and mobilization (such as equipment delivery and materials shipments), schedule the installation of any application foundations, and finally, schedule the tank erection itself. The final steps include scheduling any last site work and the sterilization and hydrotesting. 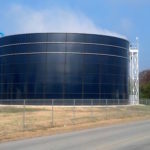 Don’t spend your money on elevated (tank) debt when the option to utilize a ground storage tank, telemetry and efficient pumping can be much more cost effective. 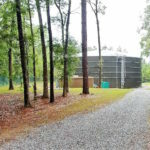 We utilize a ground storage tank—an energy head or pump power is used to achieve the required gradient/pressure zone. With this method, you can expand your tank without expanding your footprint. 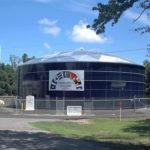 Ground storage tanks are typically a third of the cost of elevated tanks and much easier to maintain. 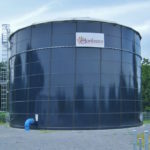 Modular, bolted ground storage tanks can also be designed to be vertically expandable to increase storage without more footprint.